The primary way to get street trees planted is to apply to the Providence Neighborhood Planting Program (PNPP). 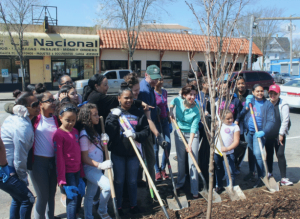 The City partners with the Mary Elizabeth Sharpe PNPP Fund of the Rhode Island Foundation to run this biannual planting program. Residents must apply for trees on their street (or nearby) to hold a “neighborhood group” planting. Residents help plant the trees on a Saturday in the spring or fall, and agree to help water and care for the trees. For more information and to start an application, visit www.pnpp.org. A homeowner may also purchase a limited number of trees that are made available at “match cost.” The cost to homeowners is currently $250 per tree, which the City will match. The Parks Department will prepare the sidewalk for planting, purchase the tree, and plant it in the appropriate season. Find the application for an individual “match cost” tree here. Lastly, property owners can purchase and plant their own street trees. However, a free permit is required from the Forestry Division so that we can make sure the site is suitable for a tree and that the tree species and size is appropriate for the public right-of-way. To request an inspection for a permit, submit a Tree Planting Permit Application. A list of approved street trees can be found here.